Steelcase Leap(R) Chair (v2) - Fabric (SC462LEAPFBRC) at Pure Design / Seating / Workspace ::: Furniture for the Home, Office, Home Office, and More at Pure Design Online! Thanks to LiveBack technology, the Leap chair back flexes to change shape as your back changes shape, providing stable support and encouraging unrestricted movement. And with its simple and intuitive adjustments - like separate controls for Lower Back Firmness and Upper Back Force and adjustable armrests that move in four directions - it's easy to adjust your Leap chair to fit you comfortably for the entire day. You can upgrade to a platinum colored frame, base, arm retainer and outer back; or upgrade further with a polished aluminum metal back frame, base and casters. 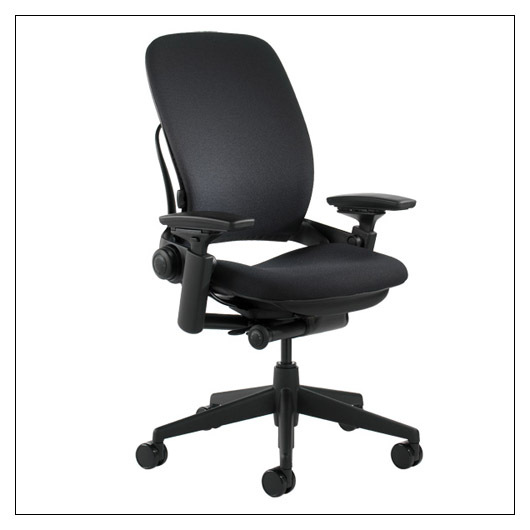 Adjustable arms, adjustable seat depth & height, adjustable lumbar, Buzz2 100% polyester fabric, black plastic frame, seat shell, and outer back. 5-arm base with 2.5" black (or partial aluminum) casters. Materials: powder-coated steel, glass-reinforced nylon, polypropylene, 100% polyester fabric. Environmental:Leap is up to 98% recyclable by weight, depending on the options selected, and made of up to 30% recycled content. Through steps we've taken to evaluate and improve the Leap chair's environmental performance, Leap has received Silver Cradle to CradleTM Product Certification from MBDC and also has Indoor AdvantageTM certification from Scientific Certification Systems as being a low-emitting product. Seat Height 16" to 21"
Please allow an additional 2 - 3 weeks to ship. This item can only be shipped to street addresses in the contiguous 48 United States.